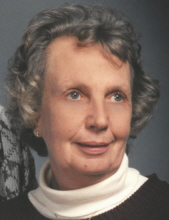 Ann F. Beine (nee Hagen) age 85 of Rubicon, Wisconsin went home to the Lord on Tuesday, October 16, 2018 at Aurora Hartford Hospital surrounded by loving family. Ann was born August 1, 1933 to Carl and Theckla (Becker) Hagen. She was united in marriage to Walter Beine on October 29, 1955 at St. Mary’s Catholic Church in Woodland. Ann loved spending time with her family and especially her grandchildren and great-grandchildren. She enjoyed watching NASCAR and the Green Bay Packers, gardening, playing solitaire, word searches and reading. Ann is survived by her beloved husband of 63 years, Walter; loving children, Paul Beine, Gail (Randy) Roskopf, Peter (Laura) Beine, and Michael Beine; cherished grandchildren, Michelle (Damian) Schmitt and Callie (Spenser) Hicks; great grandchildren, Lilly, Aubrey and Vivianne; siblings, Corrine (Milton) Roll, Charles (June) Hagen, Mary Joan (William) Klink, Mardell (Ray) Roskopf, and Jerome (Dorothy) Hagen; and sister-in-law, Arlene Hagen. She is further survived by nieces, nephews, other relatives and friends. She is preceded in death by her parents; parents-in-law; daughter-in-law, Sara Mae Beine; and siblings, Gerald and Gene Hagen, and Rita (Eddie) Knueppel. Mass of Christian Burial will be celebrated Saturday, October 20, 2018 at 11:00 A.M. at St. John’s Catholic Church (W1170 Rome Road Rubicon, WI 53078) with Fr. David LaPlante officiating. Family will greet relatives and friends at the church on Saturday from 9:00a.m.-11:00a.m. Interment in St. John’s Catholic Church Cemetery, Rubicon. In memory of Ann, memorial contributions to St. Jude’ Children’s Research Hospital (501 St. Jude Place Memphis, TN 38105, memo: Ann Beine) are appreciated. To send flowers or a remembrance gift to the family of Ann F. Beine, please visit our Tribute Store. "Email Address" would like to share the life celebration of Ann F. Beine. Click on the "link" to go to share a favorite memory or leave a condolence message for the family.